With the job market being tight and the legalization of marijuana changing the public attitude of drug use, employers are contemplating changing the consequences of a positive drug test in their testing policies. Many employers have implemented drug-free workplace (DFW) policies that require testing under a variety of conditions: random, post-accident, reasonable suspicion. An employer’s drug and alcohol policies need to be clear on what the consequences are if the results come back positive. But what options can employers consider when creating or updating their drug and alcohol testing policies? It is widely understood that, in the United States, more than 70% of substance abusers are employed and among working adults, nearly 2% are dependent on marijuana. It is only a matter of time when these statistics affect your employees. Some companies' drug testing policies allow for immediate termination when any employee in the organization tests positive on their drug test. This employee could have been with the company for decades, could have specific training on an important task, or was well liked within the company. Now, these companies often face a difficult time replacing this employee. And replacing the employee is expensive. The cost of replacing an employee can range from 25% to 200% of their annual compensation. If your company has adopted this as your only consequence for a positive drug test, it may be time to review other options that won’t cost you on employee turnover. As we discuss in this article, a construction company with 100 employees would face nearly $50,000 annually for employing substance abuse in the workplace from turnover, lost productivity, and employee health. Then add the cost of legal and financial liabilities attached to a dismissal that is associated with drug use or a workplace injury. Not testing is expensive. Drug testing is a risk-management strategy that promotes a safe work environment for all employees. For those employees who have made poor choices related to alcohol or drug use, a positive drug test and potential termination of employment serve as a motivator to engage in education and significant behavioral changes. Not all employees who test positive are substance- dependent or in need of intensive treatment. Employees who are in serious trouble with alcohol showed significant improvement in drinking behavior and job performance during the months immediately following an intervention, according to research conducted by the National Institute on Alcohol Abuse and Alcoholism (NIAAA). If you are considering dropping your drug testing program, it may be more beneficial to change the consequences of a positive drug test instead. 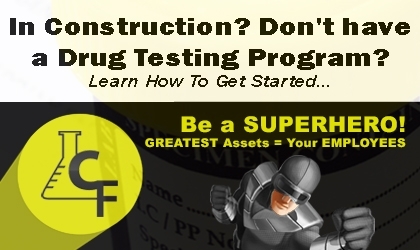 Don’t have a drug testing program? If you could significantly reduce your turn-over and risk liabilities, would it be worth it investigate whether a drug and alcohol testing program could be beneficial to your business? Immediate termination for a positive drug test is drastic. Many employers, instead, offer a “strike two” or “strike three” policy for a positive drug test. Usually, the first step is removing the employee from safety sensitive functions. Employers then use this opportunity to reiterate the employee’s value and educate them on the dangers of drug or alcohol abuse. After a certain “timeout” period, the employee is allowed to continue their main job function with the knowledge that, if there is another positive drug test, they could be terminated. If the employer communicates well in this process, this consequence can be a very successful tool for keeping the workplace safe, but could be missing an important long-term step in preventing the employee from potential help they need. In order to make the previous option more robust and helpful, the employer could refer the employee to an Employee Assistance Program (EAP) for treatment instead of immediate termination. The goal is for employees to stay engaged with the EAP in the months following treatment and return-to-work in order to support their sobriety, boost their ability to make better decisions about substance use, or possibly help them eventually recognize and accept the disease process progression if they are vulnerable to relapse. EAP counselors have received advanced training in sub-stance abuse assessment and care planning. The employee must immediately be removed from all safety-sensitive functions and is required to successfully complete the evaluation and rehabilitation process in order to return to safety-sensitive duty for the current or future employer. The SAP makes treatment and/or education recommendations for the employee and monitors the employee’s progress through completion. Based upon a follow-up evaluation, the SAP issues written documentation of the employee’s compliance with treatment recommendations, eligibility to perform a safety sensitive job and prescribes a schedule of follow-up testing. In both situations, the employee’s eligibility for return-to-work is contingent on negative return-to- work test results administered by the employer. The decision to return the employee to active duty is at the discretion of the employer. When it comes to creating a positive culture around drug testing, communication is essential to building confidence in the culture around drug testing. If employees understand the purpose of the policy and can see that it has clear and unthreatening objectives, on the whole they will feel more comfortable with what they may otherwise see as an invasion of privacy or punishment. When was the last time you reviewed your policy? Updating your drug testing policy is affordable. At CleanFleet, we look over Drug and Alcohol policies every day. As a best-in-class testing service provider, let us review your company’s policy. Fill out the form or call us if you have questions at 503-479-6082. There are 0 comment. on "Employer Options in Dealing with Failed Drug Tests"
Drug testing has been found to reduce insurance claims as much as 12%, first aid injury reports by 18%, accidents by 51%, and Experience Modification Rates (EMR) as much as 11.4%.